I signed up to volunteer a few months ago and the process to become a volunteer there has been an eye-opening experience for me. The mission of the Sciencenter is to engage, educate, and empower children through science and in order for a volunteer to be effective at this, there are a number of things that are unique to operating in this context. This is evident in the extensive training that the group at the Sciencenter excels at. If you think about it, as a volunteer, you are responsible for trying to convey what can be complex concepts to children (and adults!) at a variety of ages and levels of understanding. As you are interacting with guests, you have to first get their attention, keep their attention, make the interaction fun, and get them to start asking questions. It really is all about leading an engaging discussion and to a certain extent, it’s a sales pitch on science. If you don’t get it quite right, well… they walk away. The first event that I volunteered at was the “members only” night for the new “Crime Scene Lab” exhibit that just opened. The event was two hours long, but the volunteers were expected to arrive two hours before the start. When I arrived, there were approximately 10 volunteers. For a little over an hour, we were trained on what they call “Interactive Floor Programs” or IFPs. 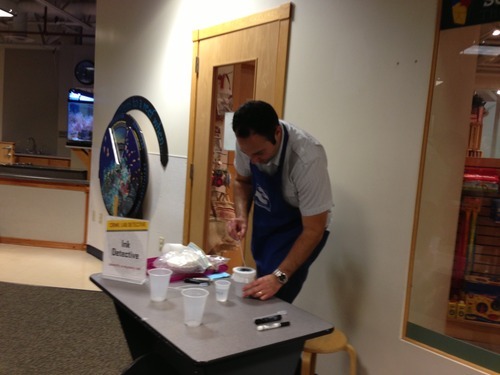 Here they taught us ways to engage and interact with guests and also how to run the experiments at our stations. My station was “Be an Ink Detective!” where we used Chromatography as a way to match different pens and ink used in writing letters. In keeping with the crime scene theme, I made up an elaborate story about a ransom letter that a thief left and testing the ink from pens found at two suspects’ houses against the ink in the ransom letter to figure out which one was guilty. This was a great story for explaining how Chromatography could be used – at least I thought. When my first guests arrived – a mom and a 2 year old, I quickly realized my story didn’t quite work for the 2 year old. I had to adjust. Over the next two hours, I came up with different versions of the story – everything from telling the kids that they were detectives working with Scooby Doo (apparently most kids don’t know Scooby Doo these days) to basically, not even telling the story and just asking if they wanted to see a rainbow (most effective).